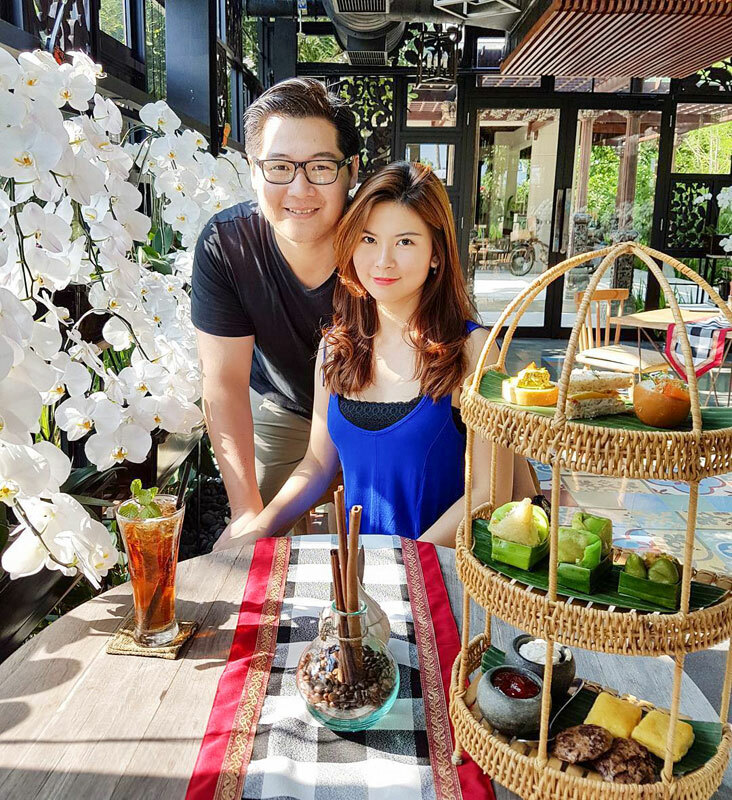 Indonesia > Bali > 12 afternoon high tea places in Bali you can indulge in on your couple getaway or girls trip! 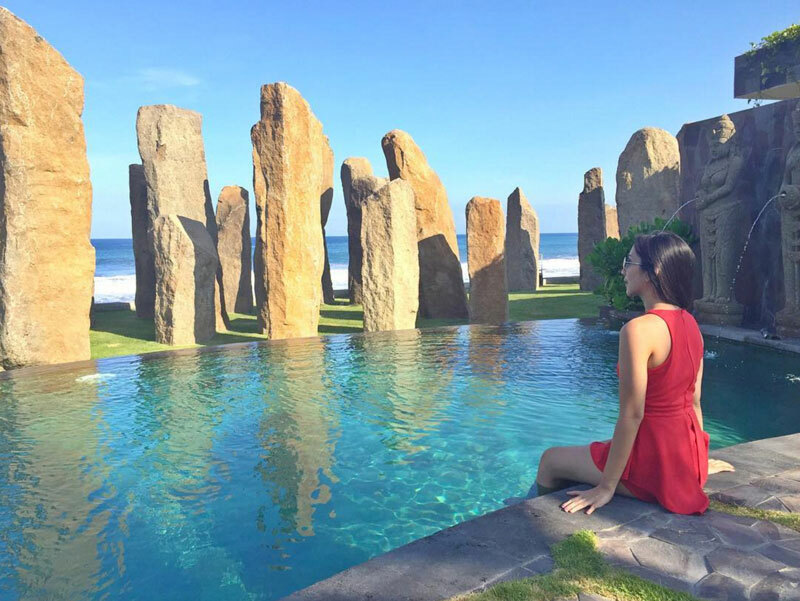 We love Bali! 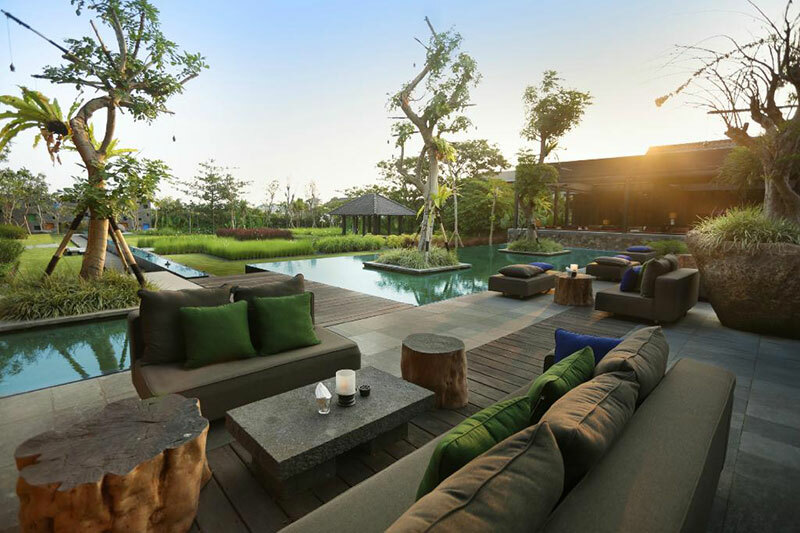 In fact we didn’t think we could love Bali anymore – until now. 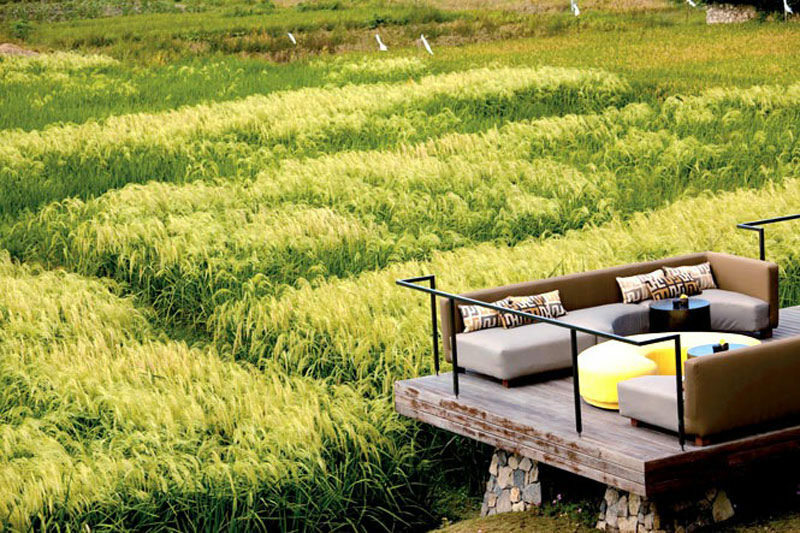 We have discovered that in various luxury dining spots across Bali, there is a new trend emerging. 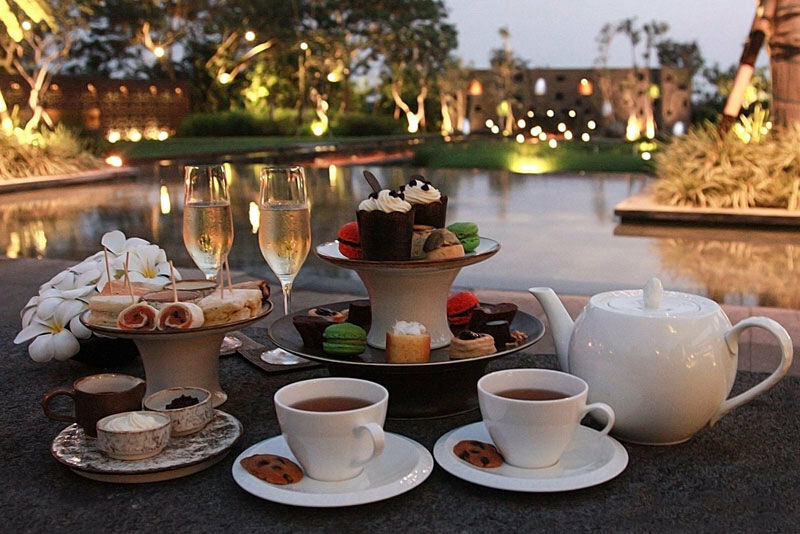 This trend has tasty treats, dainty cupcakes and amazing tea and coffee – all served in spectacular surroundings. 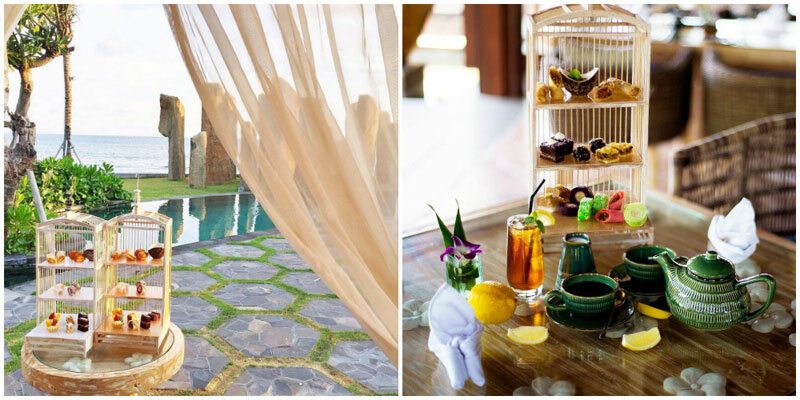 Yes, the high tea ritual has arrived in Bali! 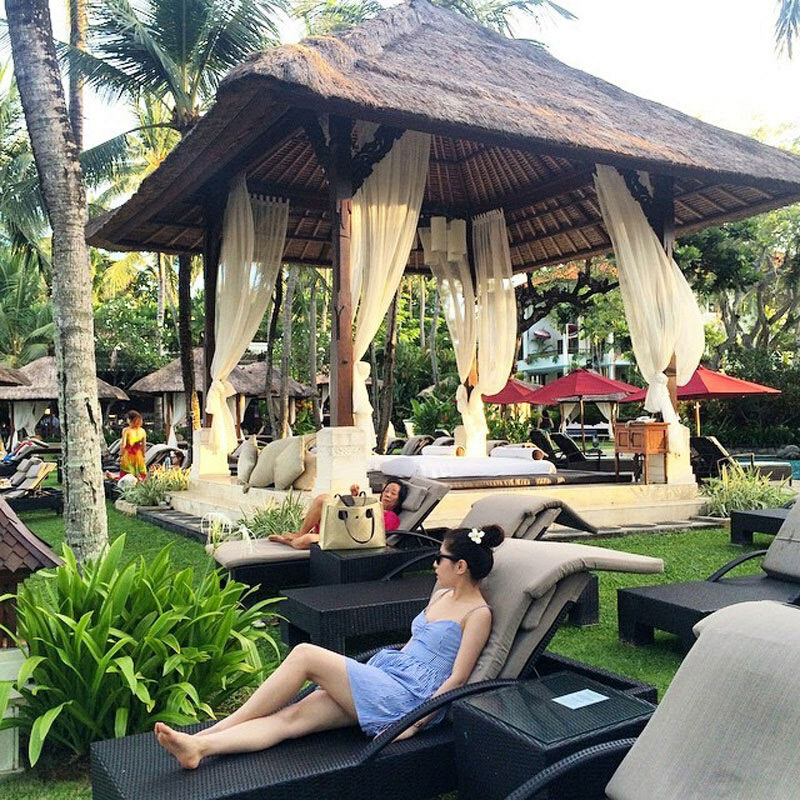 When you feel that early afternoon energy slump, then it’s time to sit down, relax and be treated like a Queen. In fact, why stick to tea? 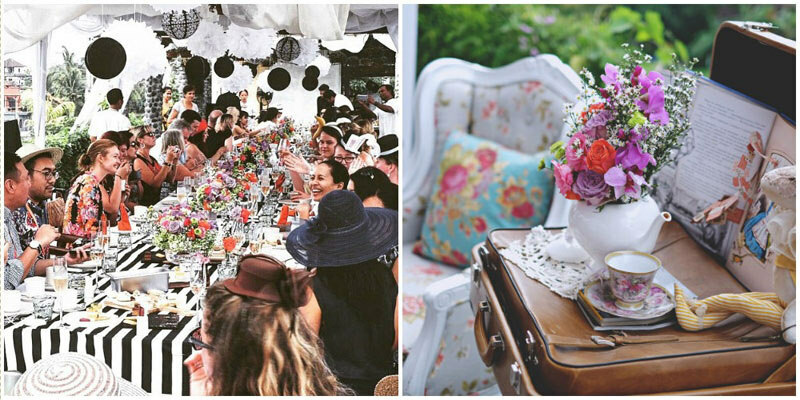 Have a cocktail or glass of champagne with that high tea and make it extra special! The best thing about high tea? Everyone loves it! 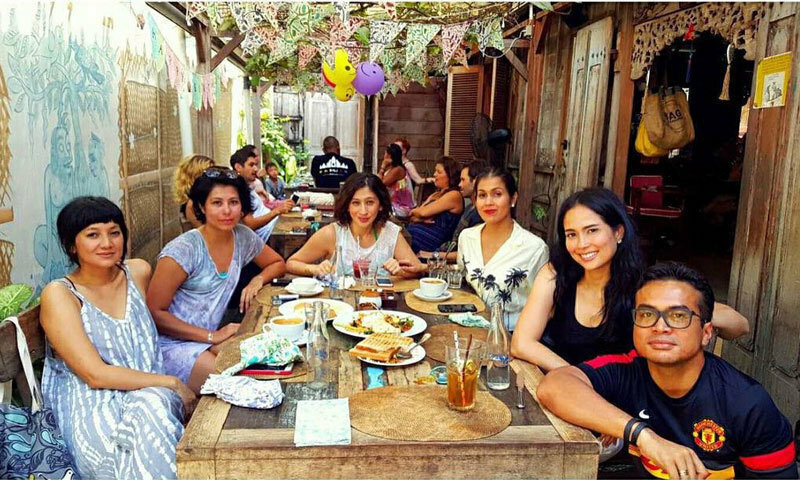 Go with the girls for a chat, as a couple for a romantic treat or even as a family – you certainly wont hear complaints from the children. Address: Jl. Monkey Forest, Ubud, Bali 80571. 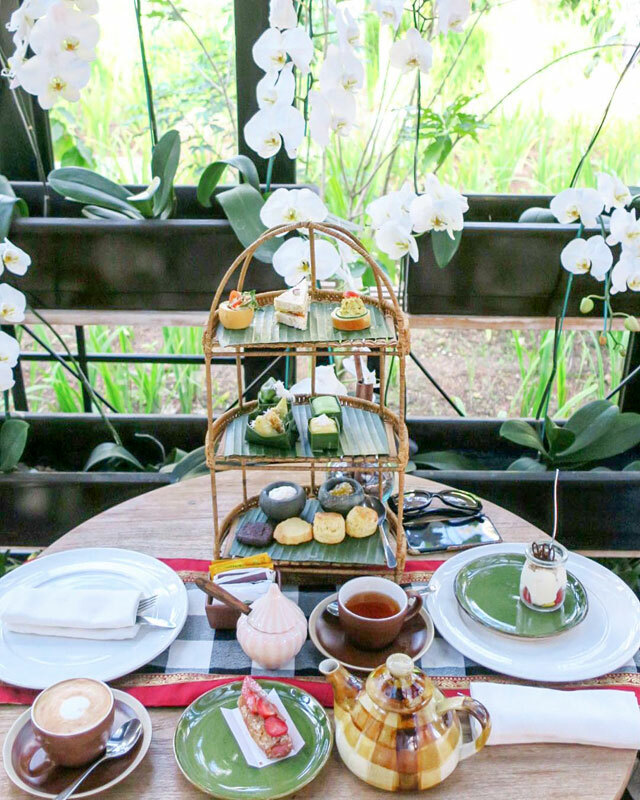 Afternoon tea time at Orchid Tea Lounge means you are greeted by an exotic collection of potted orchids, floor-to-ceiling glass windows and amazing flowering gardens and rice paddy views – making it a delightful place to while away an afternoon! The cake carriage at the lounge is a feast for the eyes and stomach, with melt-in-your-mouth kueh (a traditional Indonesian snack rich in coconut milk, sugar and rice flour), such as Kueh Gethuk (made of cassava flour and coconut sugar, served with sweetened grated coconut), Kueh Dadar Gulung (a thin and moist crepe layer filled with grated coconut and coconut sugar), and Lupis Ketan (made from glutinous rice and sprinkled with grated coconut and palm sugar syrup). On the pastry tier, chicken and tuna finger sandwiches make a welcome savoury intervention from the sweet treats. While you indulge, take a sip of warm and hearty Dilmah tea! Iced and hot coffee and chocolate are also available for those who prefer their high tea session without tea! 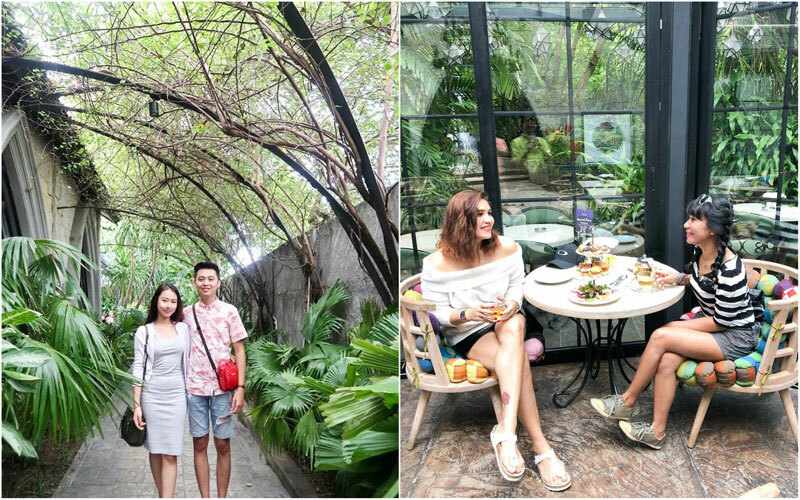 The high tea session at Orchid Tea Lounge is meant to become a tourist sideshow, something to check off your list of romantic things to do in Bali. 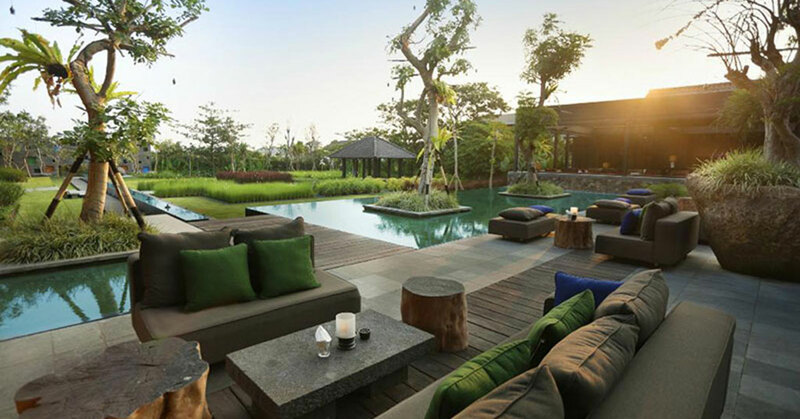 Views of the gardens and RIMBA’s outdoor event venue, the Lawn, can be enjoyed from your comfortable seat at the lounge. 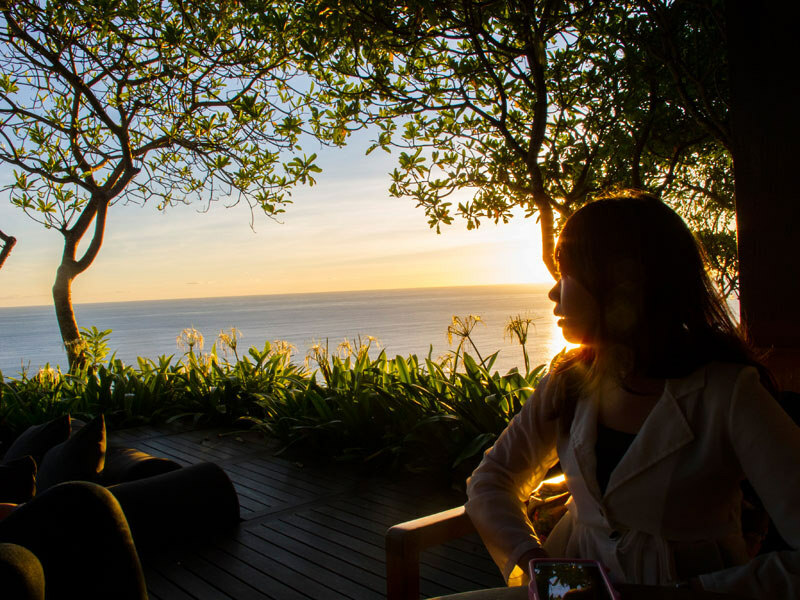 Orchid Tea Lounge is positioned right next to the Lawn, making it the ideal venue for a special occasion, such as weddings or birthdays, if what you are looking for is intimacy. 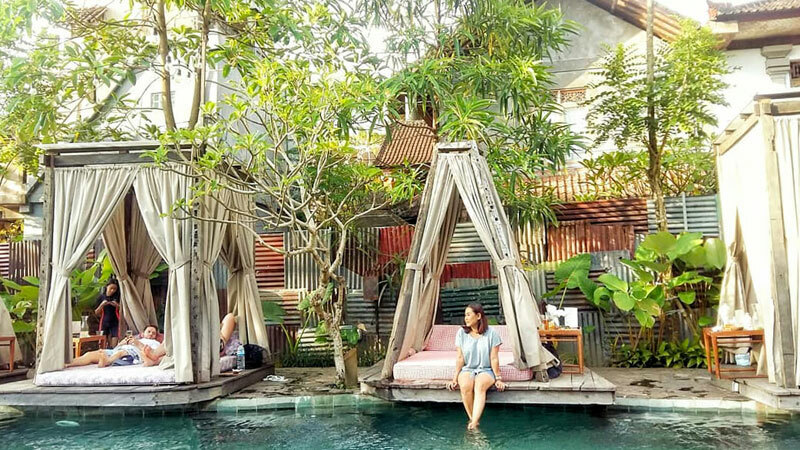 If you are keen to stay longer, drop by Kampoeng Bali for dinner – be there from 6pm onwards to immerse in an authentic Balinese experience. Following the sunset ritual procession and shopping at the on-site traditional markets, dinner is served at 7pm; here again you get to feel the Bali way of life with sumptuous local delicacies cooked right in front of your eyes so you can steal the recipe! 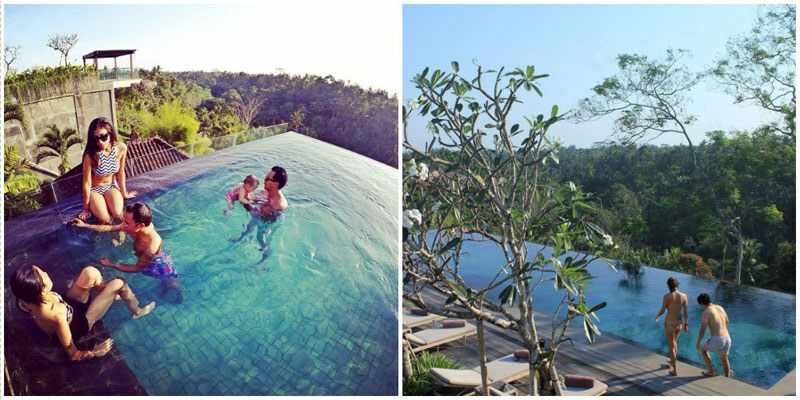 Address: AYANA Resort and Spa, RIMBA Jimbaran, Jl. Karang Mas Sejahtera, Jimbaran, Bali 80364. And if you’d like to work off those calories after consuming a mountain of cakes, simply pay an additional fee of Rp. 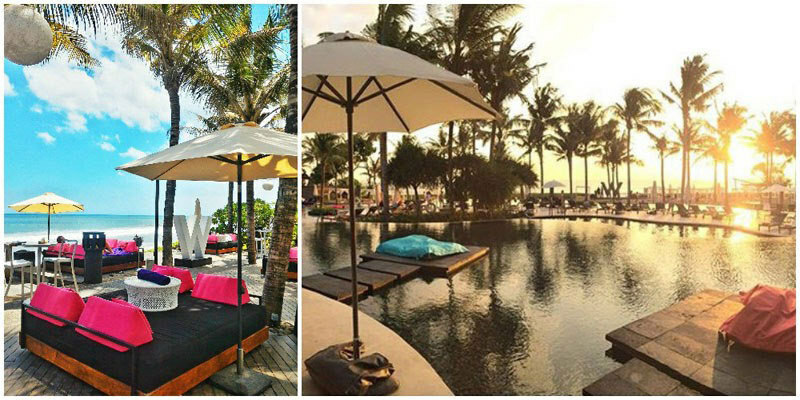 350,000 (USD $26.50) to lounge on the gazebo or swim in the pool right beside the restaurant. 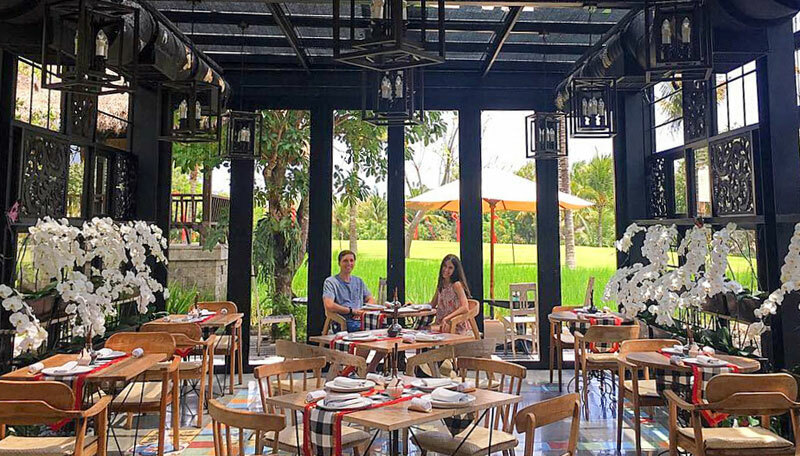 Romantic and sensual on the outside, intimate and cosy on the inside, Gardin Bistro & Patisserie is a hidden gem, like an oasis in the middle of a small forest that will make you wonder if you are still in Bali! 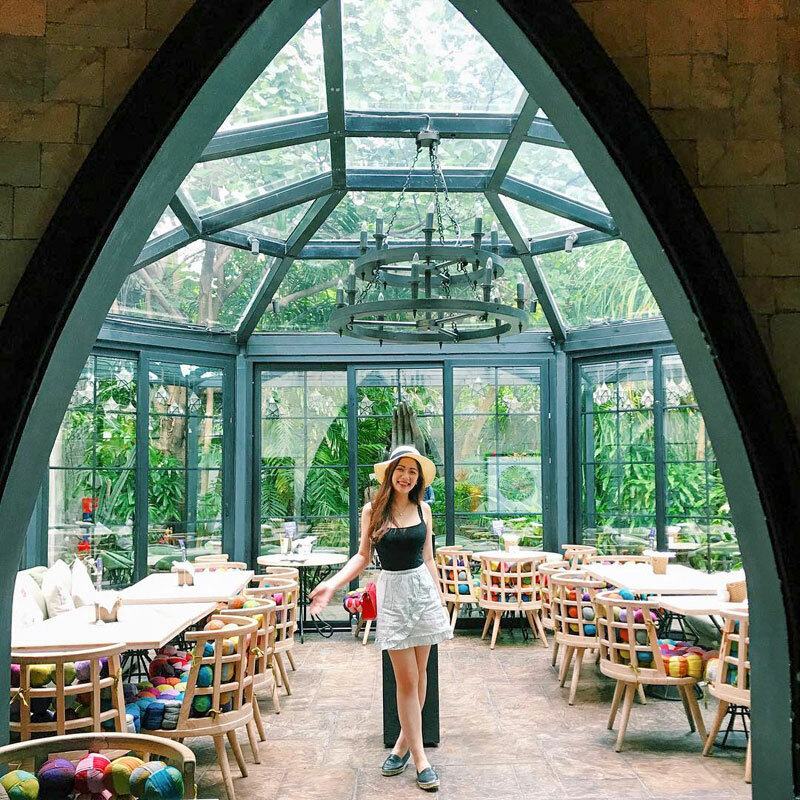 Whether it’s a weekend away with the girls, a midweek treat for Mom or a lavish yet intimate couple date, high tea at this glass house venue is favoured by many for being a necessary part of the whole vacation pampering experience. P.S. 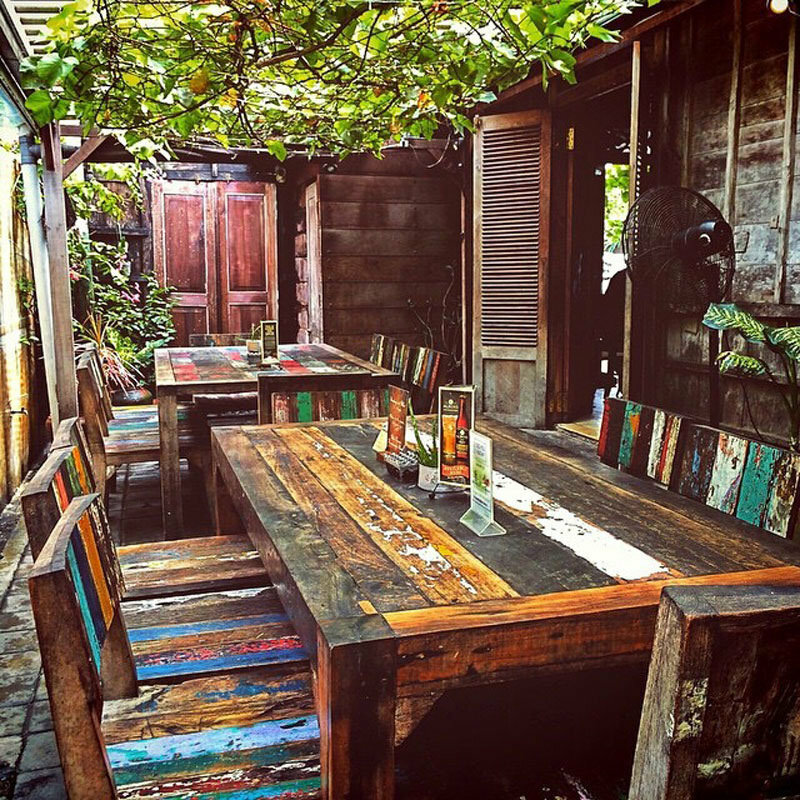 The real lure here is surely the outdoor setting of the glass house so you might want to come in early to secure a seat! 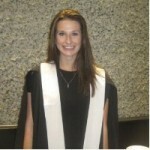 Metis claims to be an entirely sensory experience – and we agree! 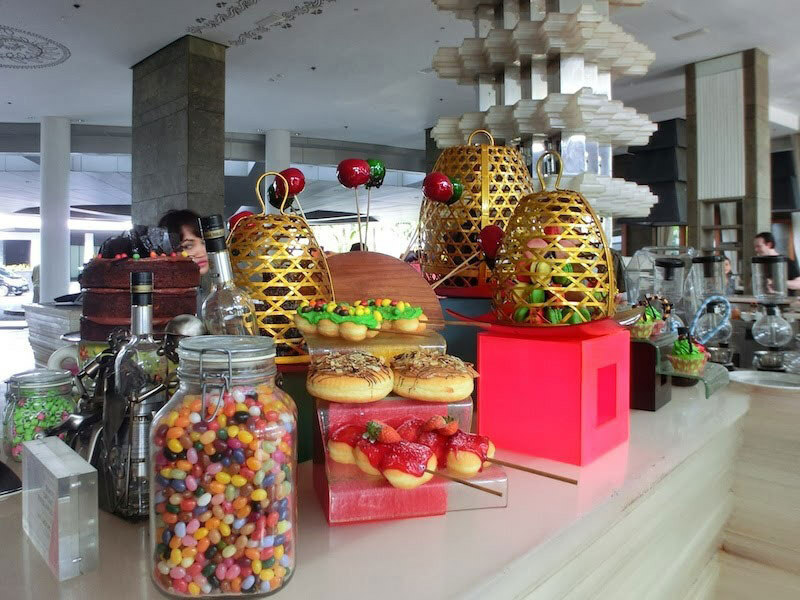 Perched up in the Lounge, enjoying the trendy atmosphere, 360-degree views, and dainty pastries ticks all the boxes for us. 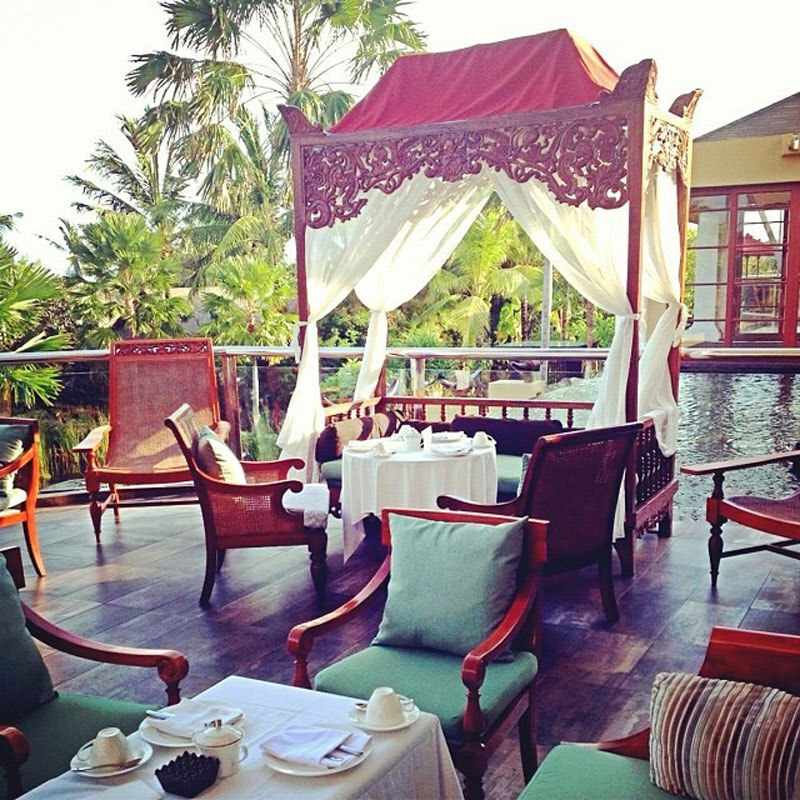 That said, you may prefer Le Jardin for a spot of tea on the tranquil and lush terrace of this super cool restaurant. 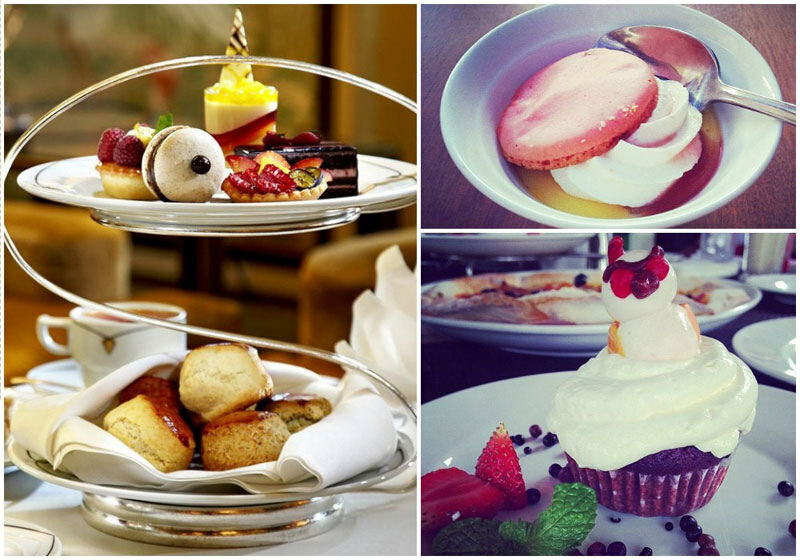 The choices don’t stop at your dining location, as you’ll also need to pick the high tea package you prefer. The Melati or the Alamanada – don’t worry both are equally delicious! 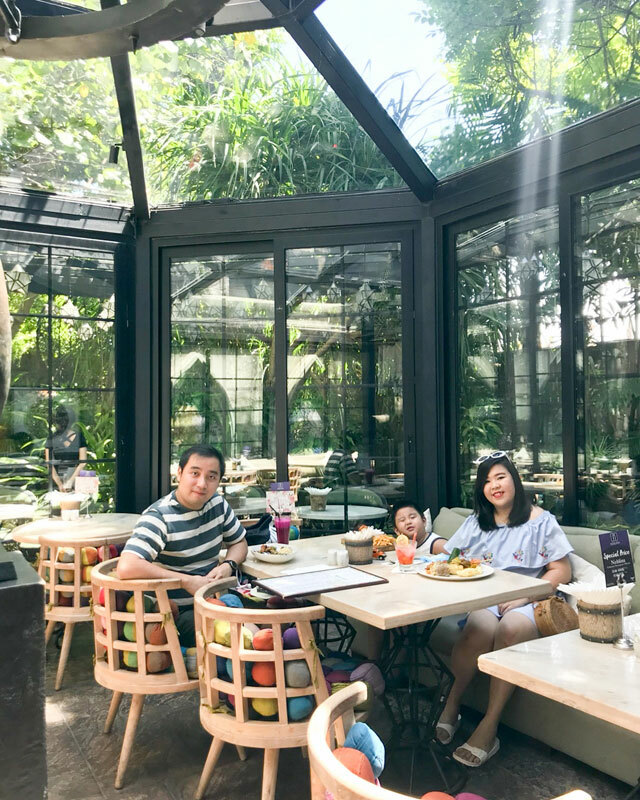 The Melati – A perfect balance of savory, spring rolls and sandwiches along with cakes and sweets. Alamanada – If you have a sweet tooth, then this will give you the sugar rush of your life. 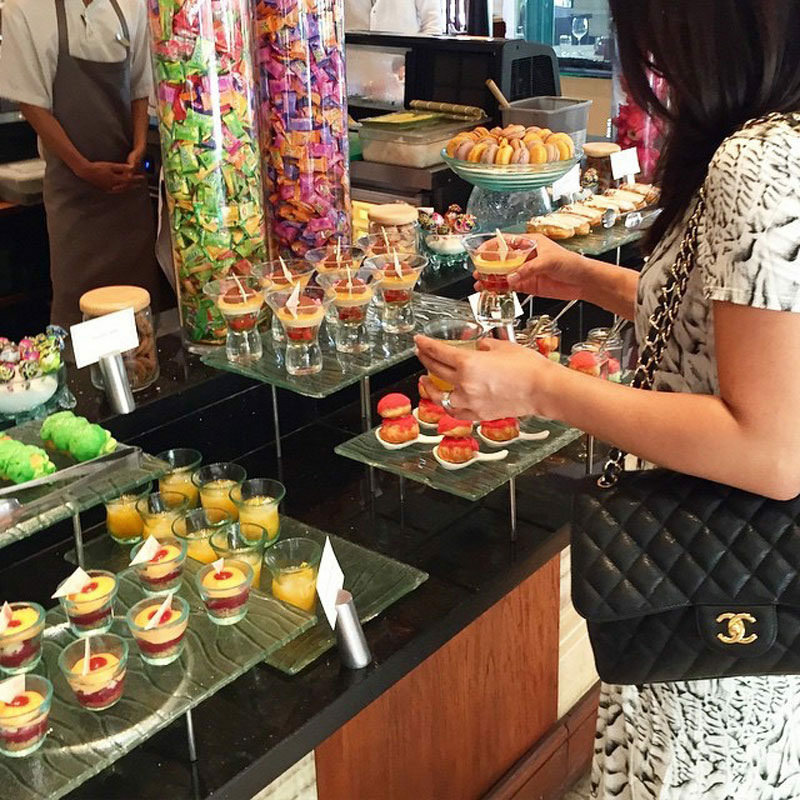 Feast on a spectacular array of cupcakes, chocolate éclairs, macarons and brownies. 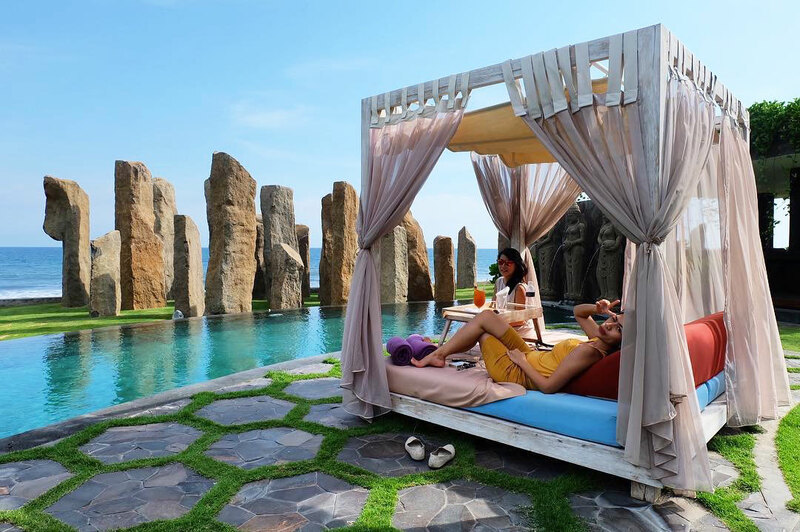 This is one for couples, it’s luxurious and has got a great atmosphere. If you are inspired by the beautiful interiors, then visit the onsite gallery and shop to top off the perfect afternoon. 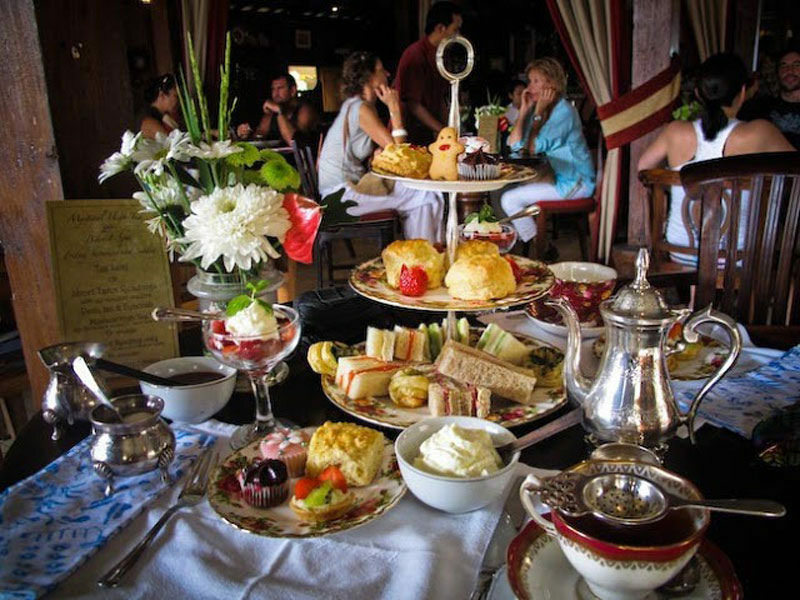 You will feel like a Queen (or King) as you are served a traditional high tea by white gloved waiters, whilst listening to the gentle flow of classical piano music. 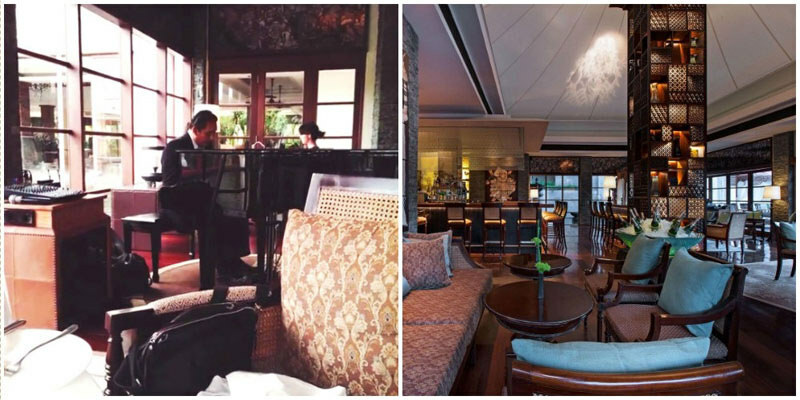 Step away from Bali for a few hours and into old world Europe in the opulent King Cole bar. The high tea is quintessentially British, with award pastry chefs creating the most divine treats. Even better than that – it’s buffet! Eat as many of these fabulous creations as you want. Why not jazz up your afternoon with St Regis’s signature cocktail – a Bloody Mary? It will certainly put a spring in your step. 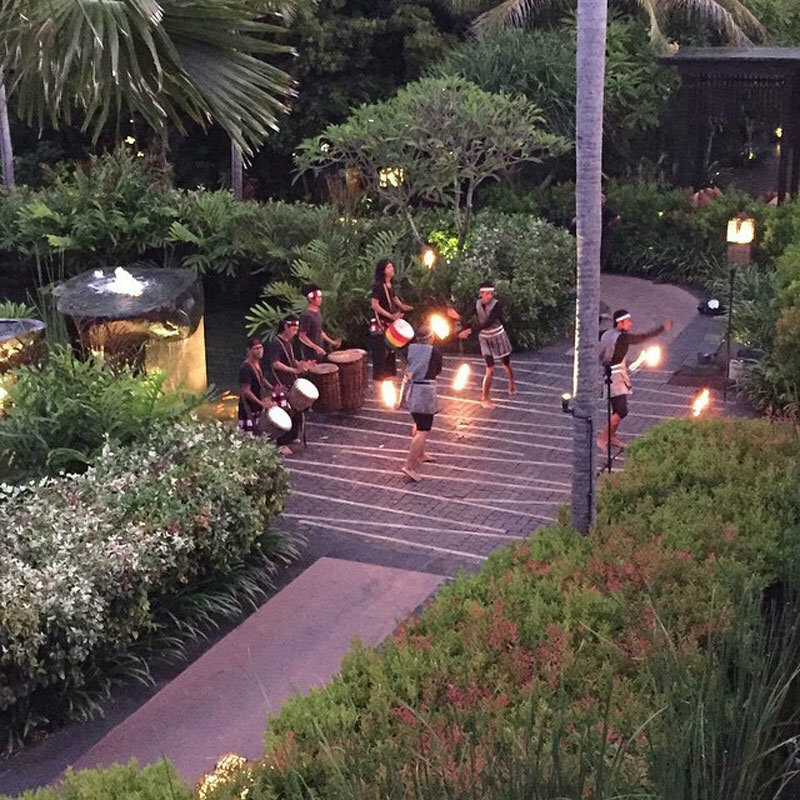 If you stay into the early evening you can expect to see the impressive King Cole traditional dancing and fire show – you might as well stay for dinner too. 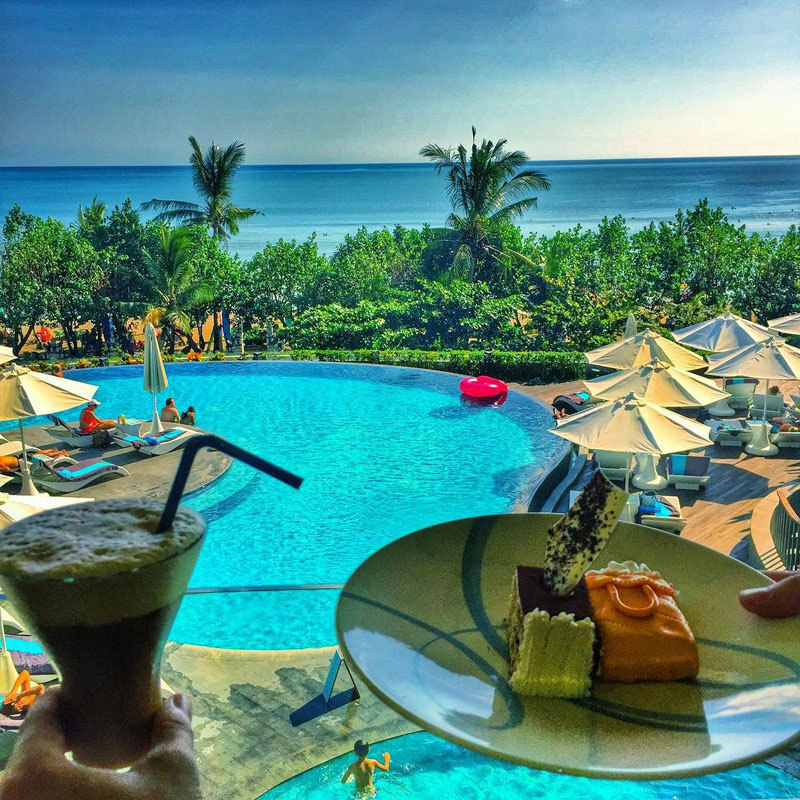 When you have shopped ‘til you dropped along the fantastic Kuta beachwalk, you need to nip into the Sheraton for the fashionable way to enjoy afternoon tea. Don’t worry, the shopping doesn’t stop at the Sheraton. Pick up a quirky little basket and head to the T Kiosk for a little slice of shopping heaven. 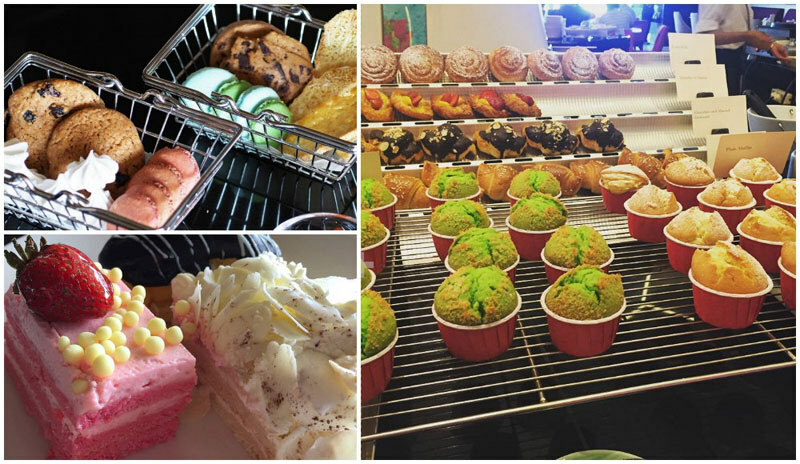 Browse the shelves and pick whatever savory or sweet treats take your fancy. Don’t miss out on the cookies – they are divine! The Sheraton knows that sometimes you need more than tea to fuel you for an afternoon of shopping, so why not indulge in a ‘Tea Tail’. 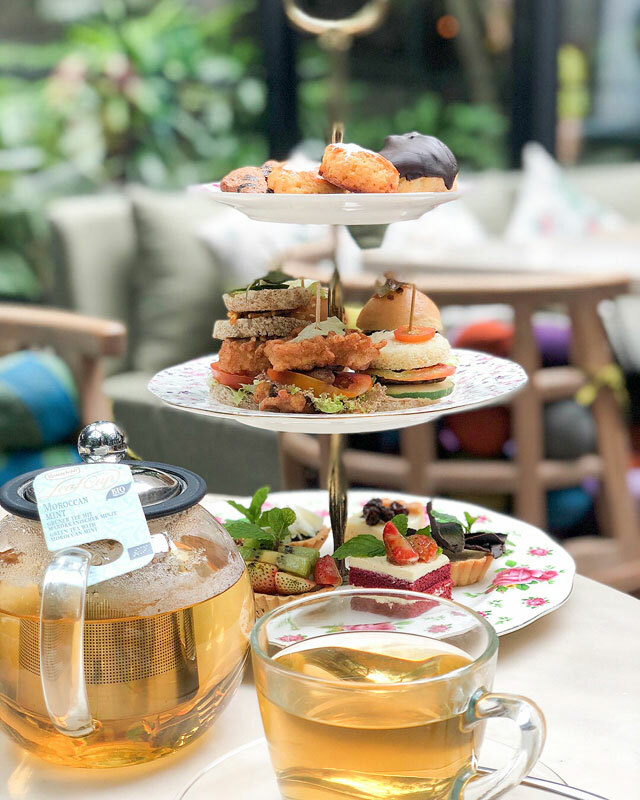 A selection of tea infused cocktails that bring high tea to a whole new level, accompanied with refreshing tea inspired cuisine delights and free flow of fresh scones. If you are shopping with the girls then be prepared to stay for the afternoon, you might even catch a fashion show while you are there! 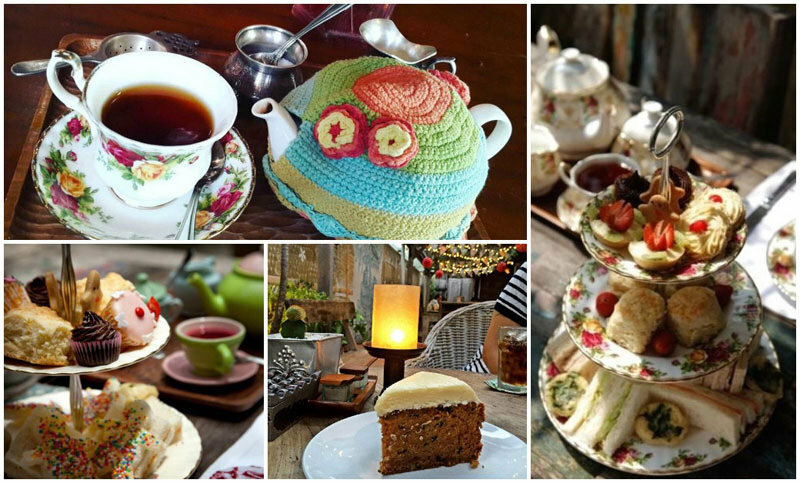 Biku Bali balances it’s cute and sophisticated interiors with quaint flowery plates and hand knitted bright tea cosies – who knew that teapots had little hats to keep your tea hot? 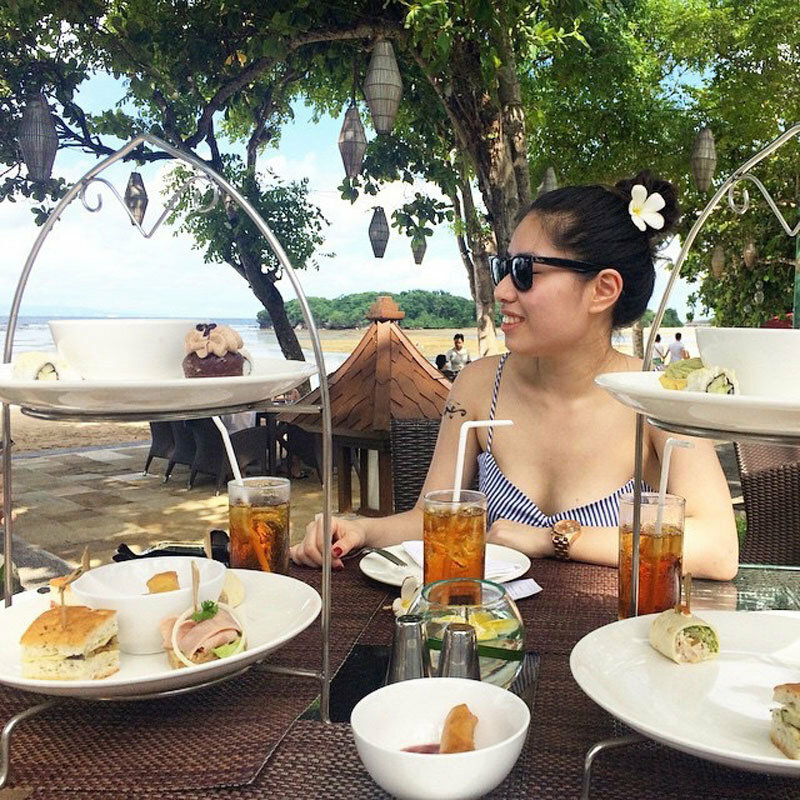 There are a variety of high tea packages here but it’s the Asian high tea that tops the charts for us. Whilst sipping on delicious masala chai or oolong teas, enjoy fusion treats such as date scones with mango jam and kue mocha. Or try their famous carrot cake. 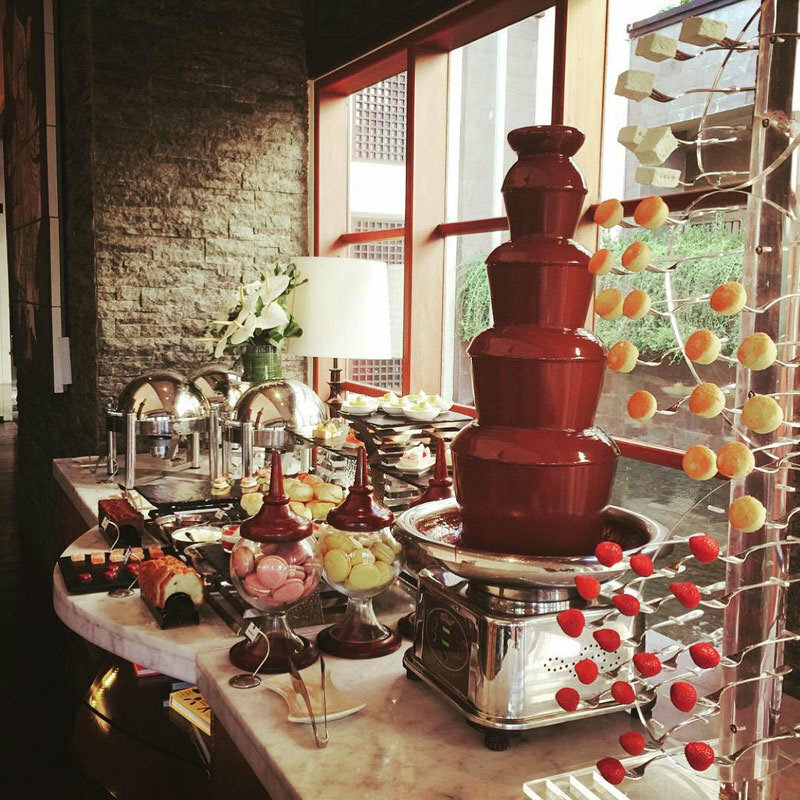 For something completely different, try the breakfast high tea – nothing beats 3 tiers of sausages and eggs. 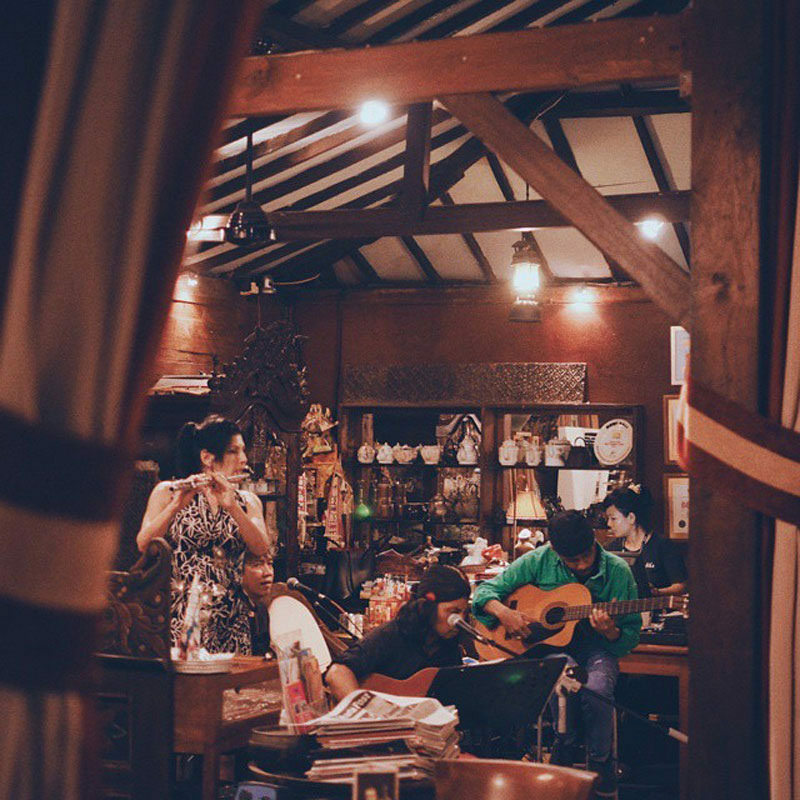 While you enjoy your high tea, they also have relaxing live acoustic music to keep you entertained. 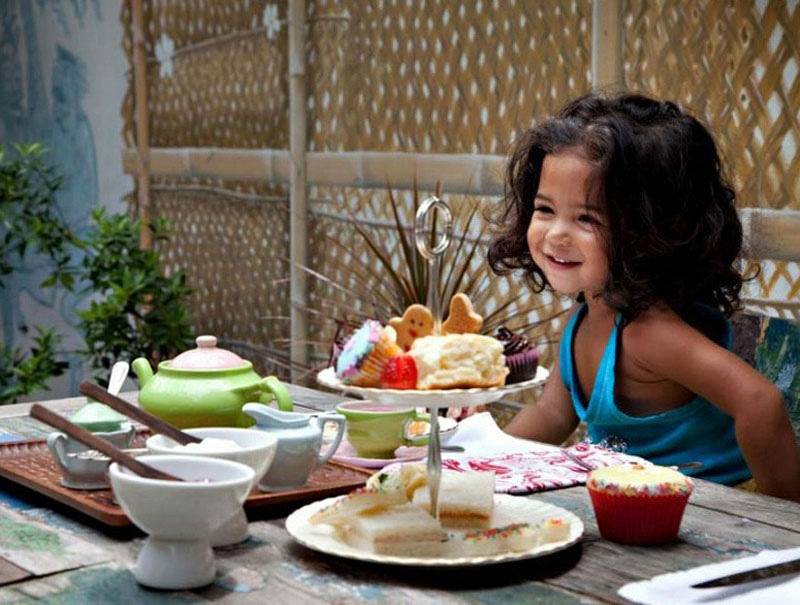 Don’t worry if your little ones are driving you crazy – the children’s tasty high tea treats will keep them happy and give you a little peace. 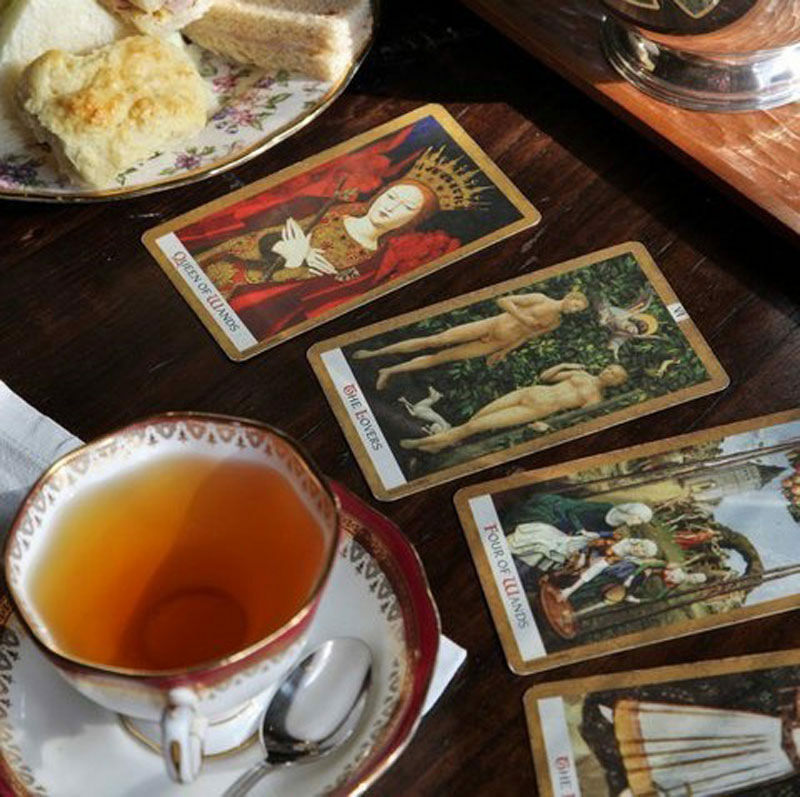 While you are relaxed and nibbling on a pastry, why not treat yourself to a 15-minute tarot reading ($11). If you are lucky the future will have plenty more high teas in it! 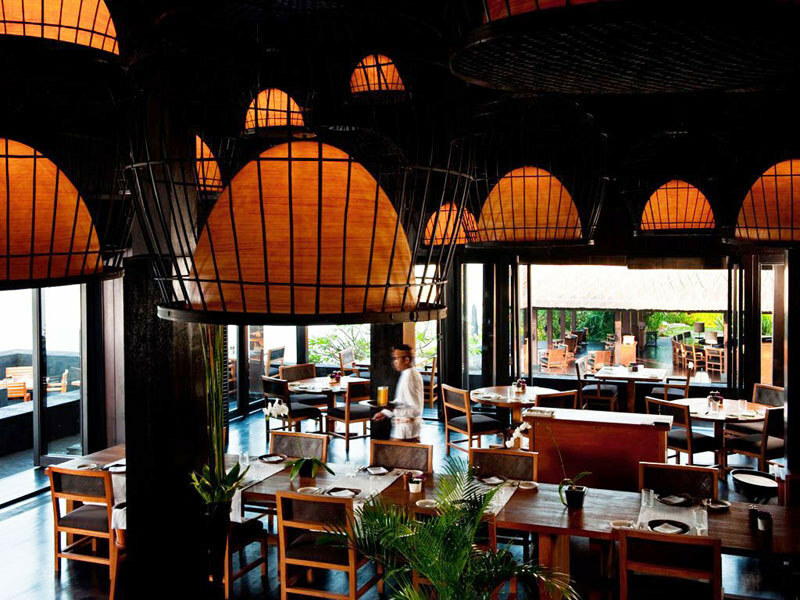 Address: Biku Restaurant Jl. Raya Petitenget 888 Ph. 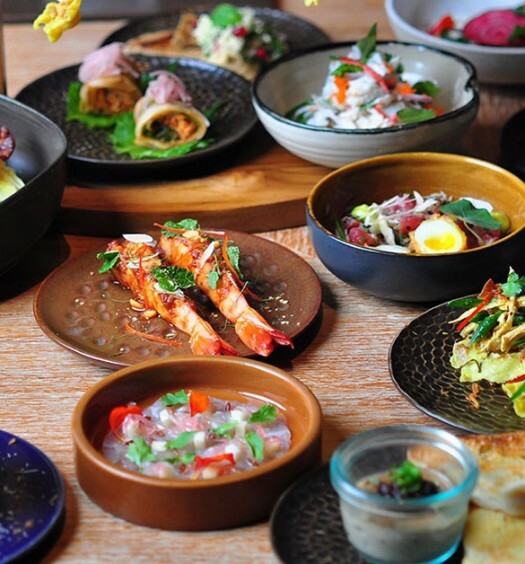 The Copper Kitchen at Bisma Eight is an eclectic blend of modern, retro and pure awesome. 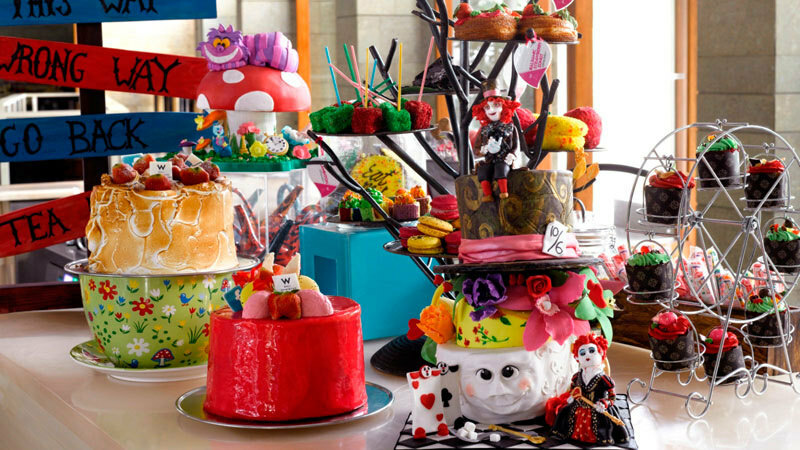 At this year’s Bali food festival Bisma hosted a Mad Hatters tea party – and we totally understand why! 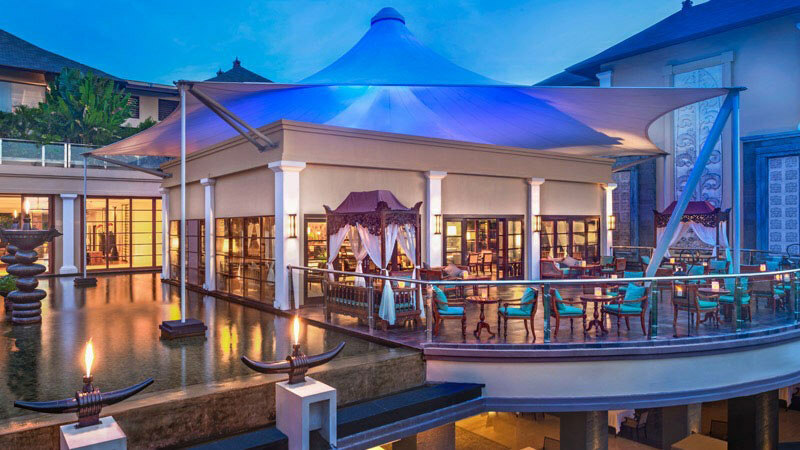 The glass-fronted restaurant affords you a spectacular view across the beautifully sculpted resort while you tuck into your afternoon feast. 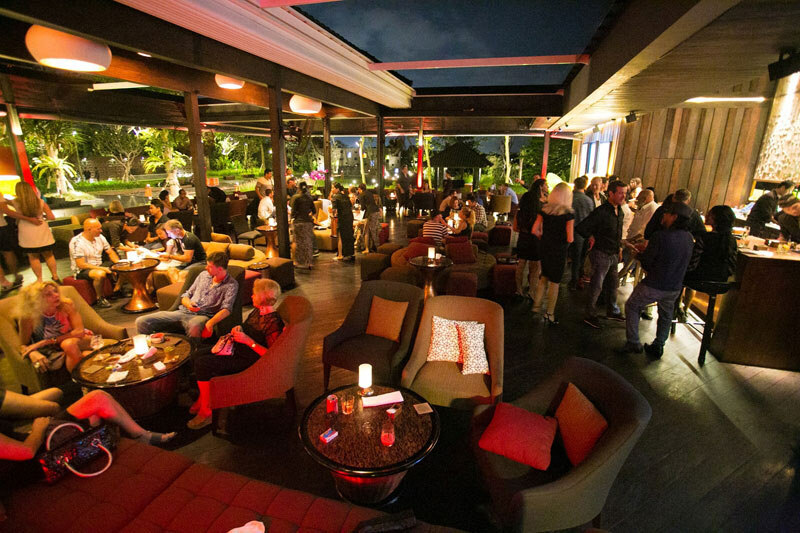 Take it to the next level and grab a table on the rooftop terrace. Recline in absolute luxury and watch the sunset. 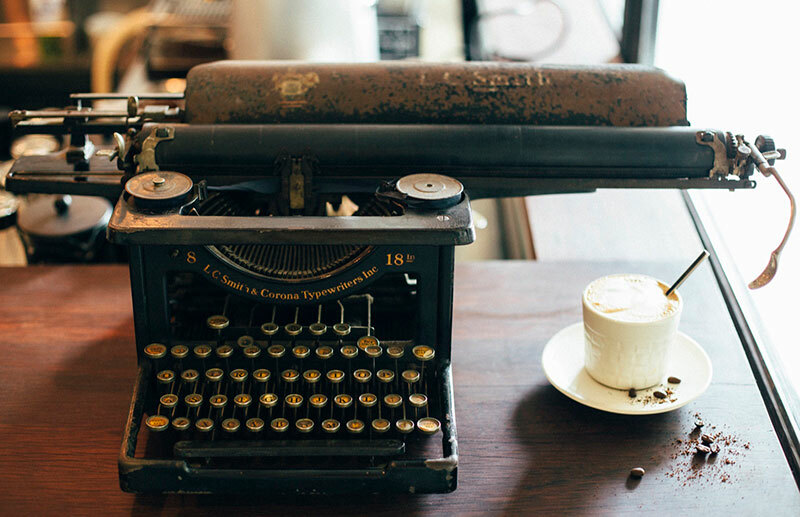 Quirky is an understatement as far as this restaurant is concerned, the beautifully crafted restaurant interior is adorned with unique and vintage items – fancy using a typewriter anyone? 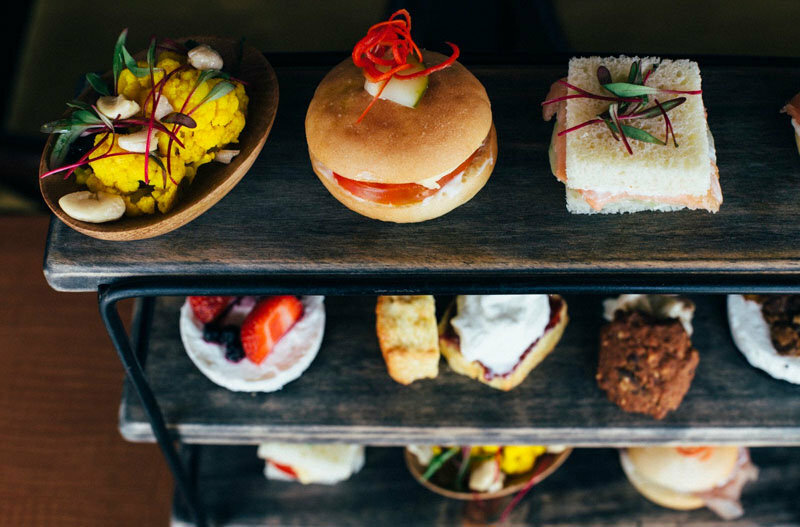 High tea arrives on an unusual wooden stand and caters for everyone. Are you gluten-free? Vegan? 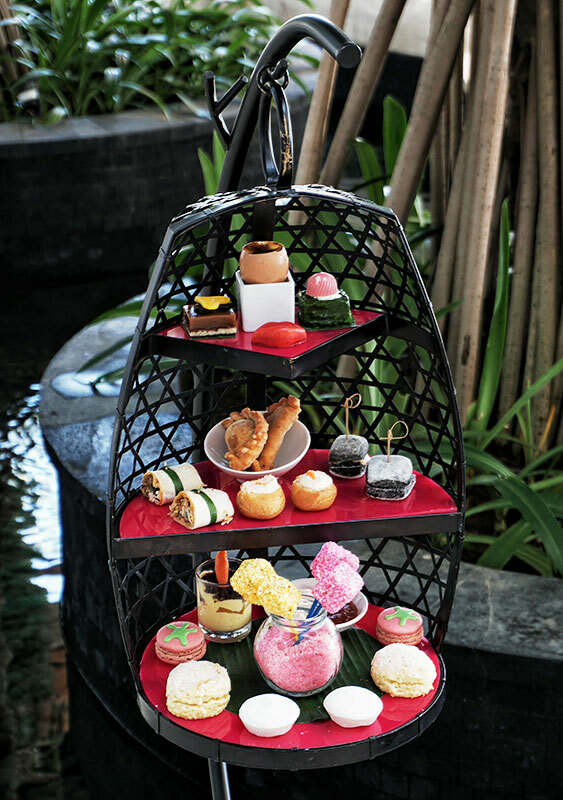 Bisma Eight can create magical high tea for all dietary requirements. 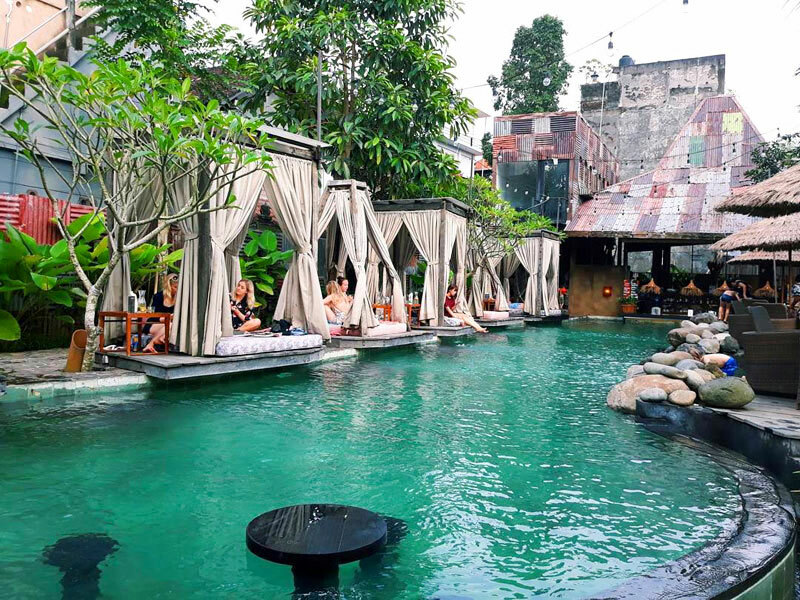 If you want to stay on and cool yourself off after the high tea, you can also pay additional Rp 60.000 (approximately USD $4.2) to swim in their amazing swimming pool. 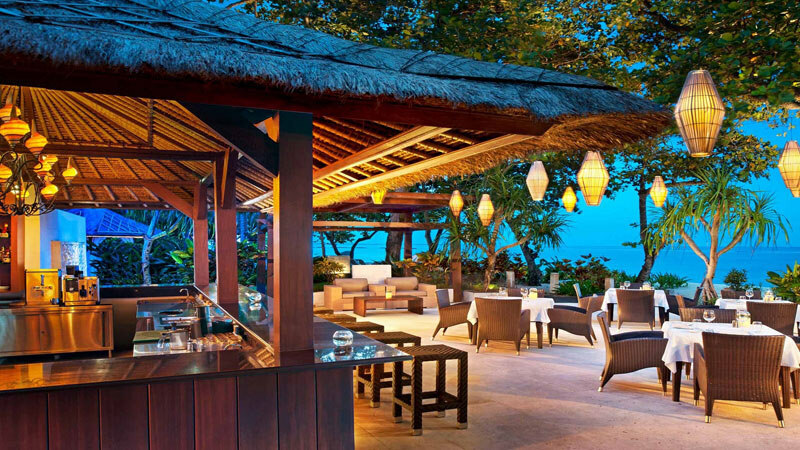 Any trip to a bar in the afternoon is good with us but especially when it’s a trip to ‘The Bar’ – the fabulous cliff top terrace bar at Bulgari Resort. 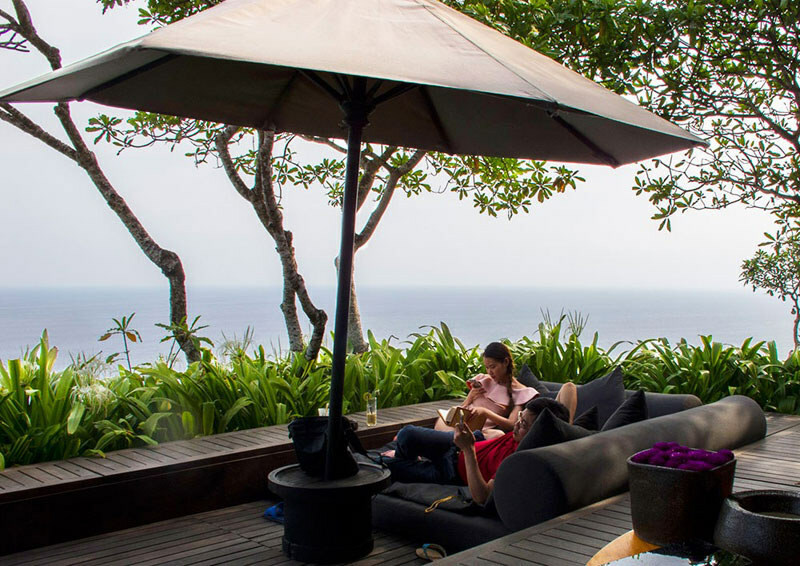 This resort boasts the most sophisticated service and fine dining, yet still achieves a relaxed, earthy and traditional Balinese feel. 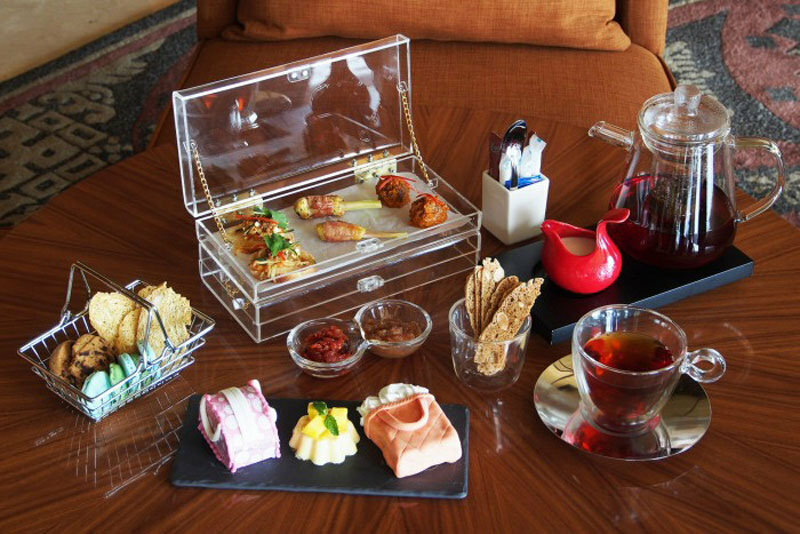 Sample some local delights in a fusion high tea platter like we have never seen before. 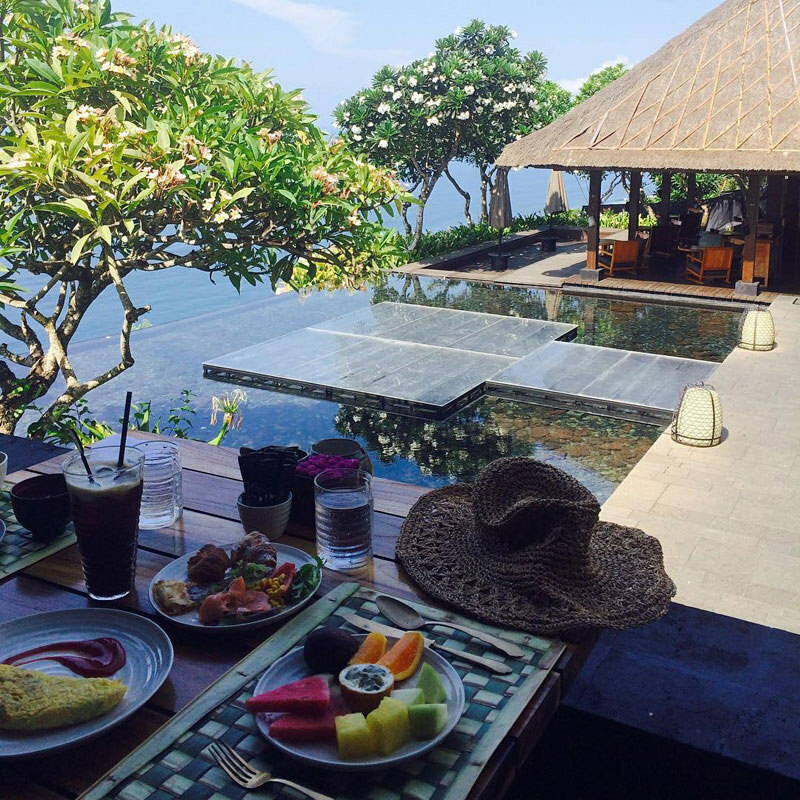 You will leave feeling happy, satisfied and with a taste for that cheeky Balinese twist! 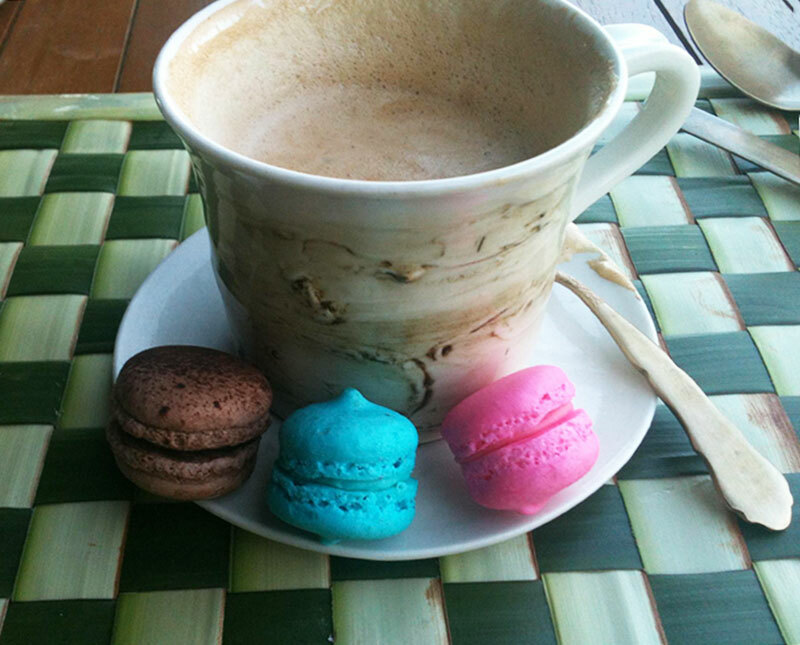 The only thing to distract you from the spectacular views during high tea is the equally specular macarons. You have to see (and taste) them to believe how good they are! 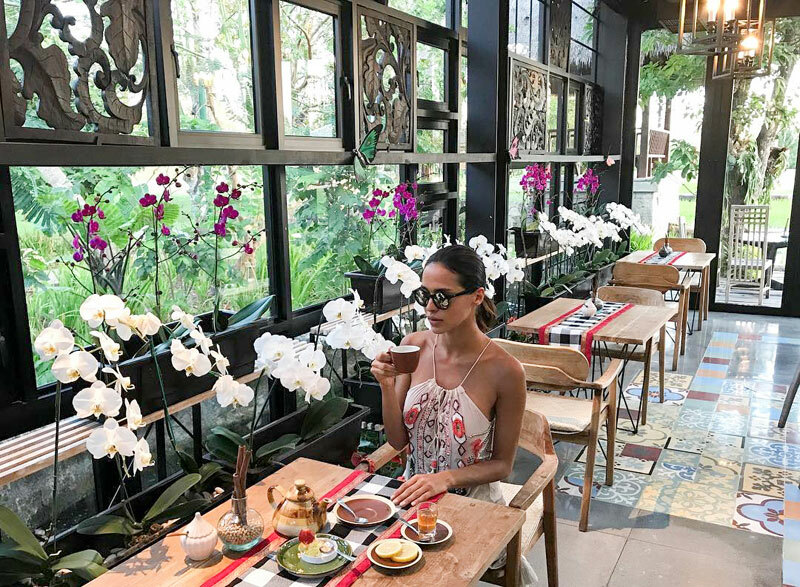 Replicating the view, ambiance and taste of a high tea at the Bulgari Resort is impossible so you simply have to visit to experience it. 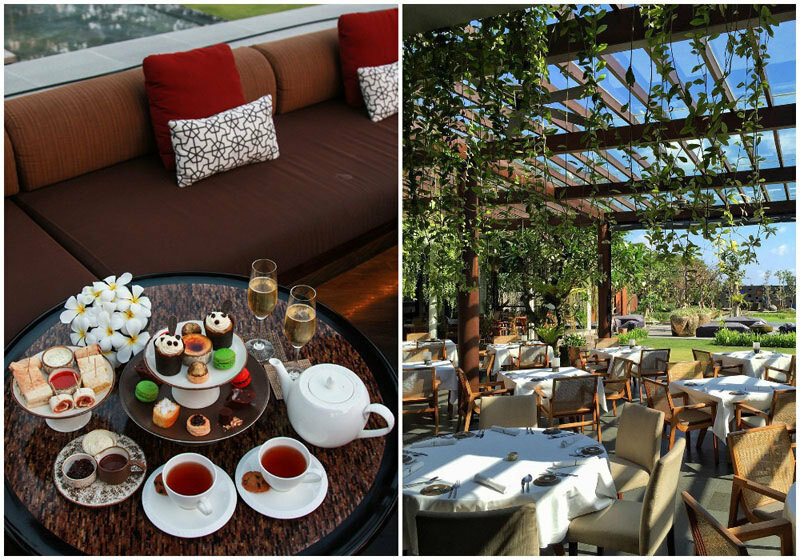 Price: Mains Afternoon tea package starting from Rp 395.000 per pax (approximately USD $29). 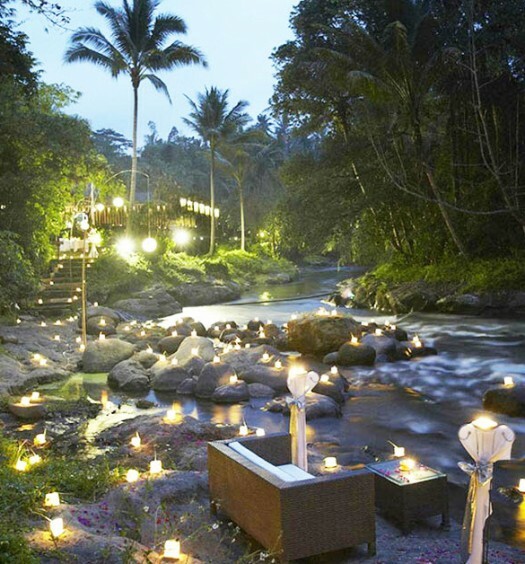 Nowhere does beaches like Bali, and nowhere does fine dining like the Arwana at the Laguna. Add some sweet treats and a cup of tea into the mix you know this is going to be something special. 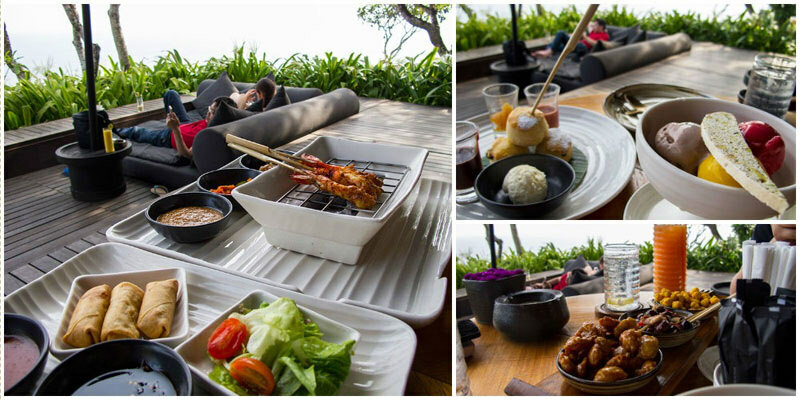 Everything tastes better when you are dining on the beach, with the sand between your toes and sea breeze in your hair. Sit back and relax, it’s time to chill. 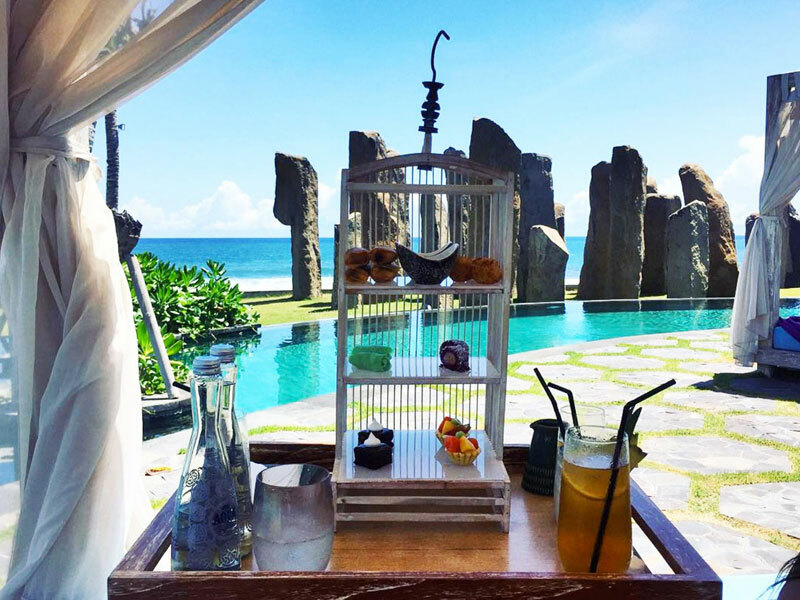 Enjoy delicate French pastries and a mouthwatering array of Indonesian sweets whilst watching the waves lapping against the pristine white beach. 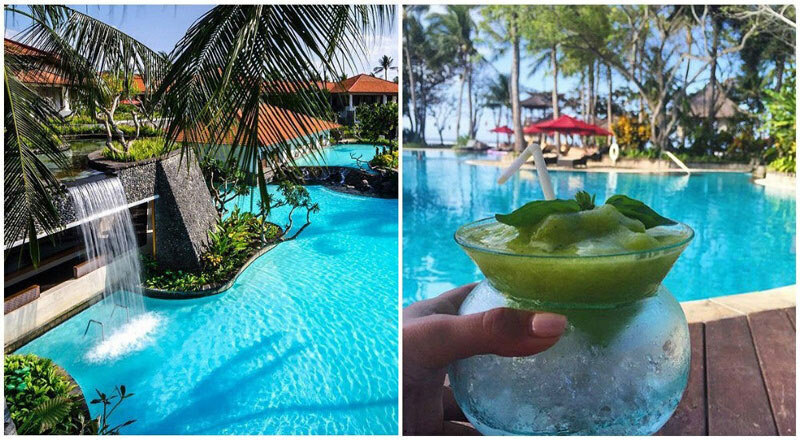 We think this is the perfect way to spend the afternoon after a busy day. 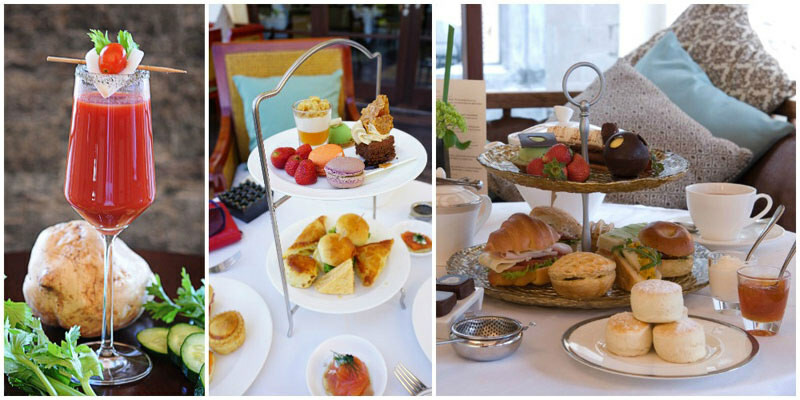 Watch the world go by whilst enjoying 5-star service and a truly sublime high tea experience. The secret is out is so make sure you are at the fashion forefront and enjoying these delicious high teas with the rest of the trend setters. 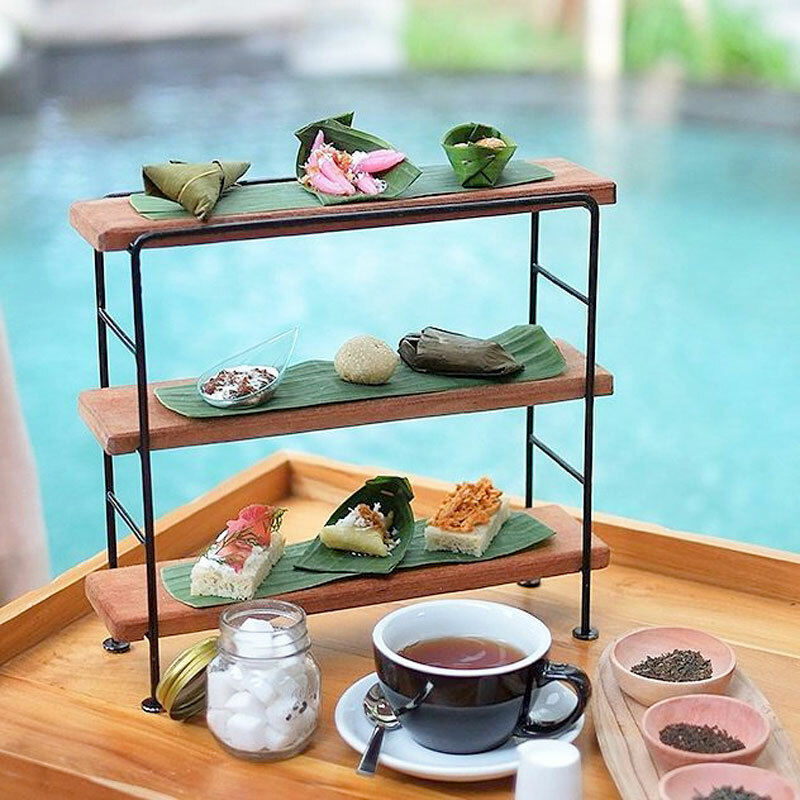 High tea in Bali is an unforgettable experience, a perfect combination of world famous chefs preparing delicious treats, utterly luxury surroundings and that relaxed Balinese vibe that you can’t find anywhere else on the planet. 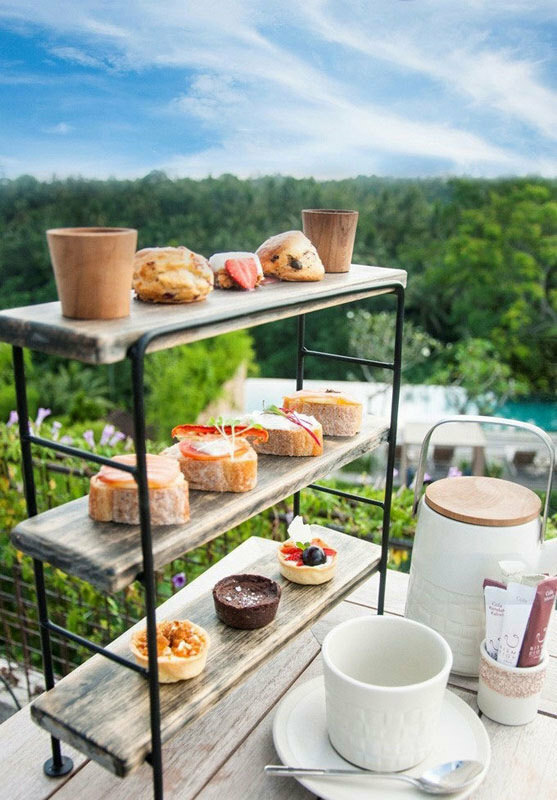 You haven’t lived until you have had a high tea in Bali, in fact if you haven’t lived until you have tried all 8 high teas on our list. Go on – enjoy!! 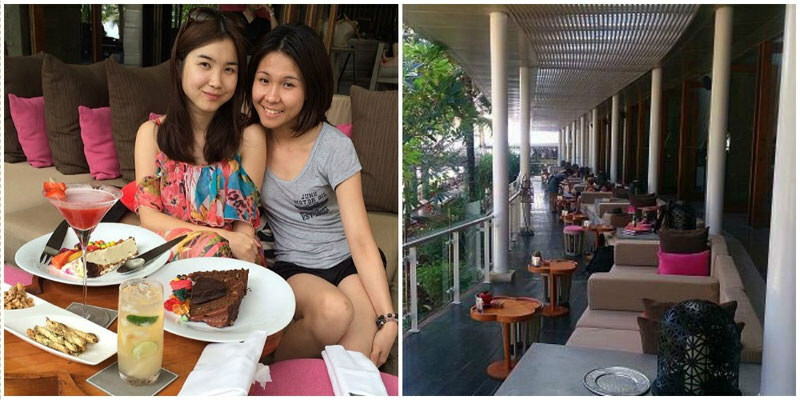 Are there any more great afternoon high tea places that we should check out? Comment below to let us know!